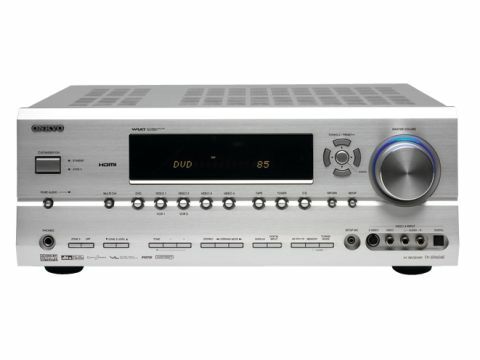 In fact, not more than a couple of months ago the Onkyo TX-SR674E hit the test bench and came up trumps for value. The TX-SR604E tested here is the lite' version of the same thing; the bean counters at Onkyo giving it a feature trim to hit a £100-lower price-point. In reality, this is the actually the base model and the SR674E adds features and tuning to the mix. I certainly liked the GTI version but can this model still tickle the senses? The SR604E offers a little less power at 90W across seven channels, and gone are the modifications and tweaks specifically tuned for UK ears. Most significantly there is no HDMI upconversion from analogue video inputs on this model, and the setup menus are only output via analogue video connections. Both HDMI and some sort of analogue video cable will be required between amp and TV even if you have all-HDMI sources. But don't take those omissions too seriously, because at £400 the SR604 still offers a packed features list. You get excellent connectivity with two HDMI inputs that can break out digital audio, plenty of analogue connections and HD- compatible component video. The Pure Audio mode that wowed my CD collection on the SR674E is present, too, and you can allocate the surround back channels as active stereo Zone 2 output if desired. The Audyssey's 2EQ RoomEQ system is retained, along with a mic and fully- automated setup. Painfully, you can't trim or even view the Audyssey values once they have been set with the auto setup routine, meaning if you want to manually adjust the EQ filters you have to start from flat and work it out from scratch using your ears. Frankly, I'd rather be using my ears to listen to a movie. The SR604E may look ugly, but the Onker's charms are all visceral. You will have to manually disable the Audyssey to get a feel for the raw beast, but it packs every bit as much up-front gusto and clarity as its bigger brother. Fine details and little effects are made obvious, and articulate and the dynamic punch across the spectrum is impressive for such a budget contender. Put on Mission: Impossible: III (if you've got it) and the stark, almost score-free sound is wide open and packed with subtle detail and atmosphere. Try listening to parts of this movie with you TV or projector switched off to really feel how a director creates an ambient sound that all but paints the scene on its own. The Onkyo plays this effect with considerable aplomb and backs it up with frighteningly percussive dynamics. Gunshots are given a tangible in-room experience. The SR604 is just as fast and tight as the SR674E and is excellent at crafting an edge-of-the-seat experience that keeps the heart racing. The Audyssey implementation has a rather black-art feel about it, as there is no way to tell exactly what it is doing to the filters - other than toggling on and off and listening to the difference! But there is a far less dramatic change than most auto-EQ implementations elicit; the system gently removes a layer of mid-range malaise without turning the sound into a tizz and boom monster. With the M:I:III disc the Audyssey effect is very subtle indeed. There is a minor upgrade in spatial effects and a gentle taming of the slightly forward treble. This is most noticeable at higher volumes where the SR604 begins to run out of steam, the Audyssey reducing its propensity to sound splashy and sibilant when pushed. Depending on your basic room acoustics, the chances are you will find some films that sound better with Audyssey and some without - give it a try in the first chapter and take it from there. Stereo music is a bit flat and congested - until you hit the Pure Audio button. This has a dramatically positive effect on two-channel performance and elevates the Onker from mundane to spectacular. The sound gains acres of space, better clarity and is infused with a richer, warmer bass. The SR604's slightly lower power figures don't seem to have a marked effect on sheer grunt, which rather begs the question: what is the difference between the UK-tuned and non UK-tuned sound? Um, not a lot is the answer - and I am starting to smell a bargain in the offing. Of course, that lack of HDMI up-conversion can be a first-class pain for those with a few video sources, but is it worth £100? If you can live with a few cables going to your display, then this is a superb value home cinema receiver with class-leading hi-fi stereo ability thrown in for good measure. Yup, it's definitely an AV bargain.